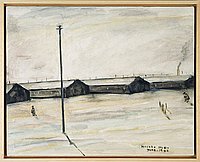 Image in white, black and grey hues of a utility pole in front of a row of four snow covered barracks at Topaz concentration camp, Topaz, Utah. Lone utility pole stand in foreground left with shadow extending to bottom edge. Two figures at midground, one at far left, the other at far right. Barracks create horizon line. Smoke rises from smokestack of barracks at right. Signed in caps, LR: Hisako Hibi / June 1943. Written on back: White Heat June 1943. 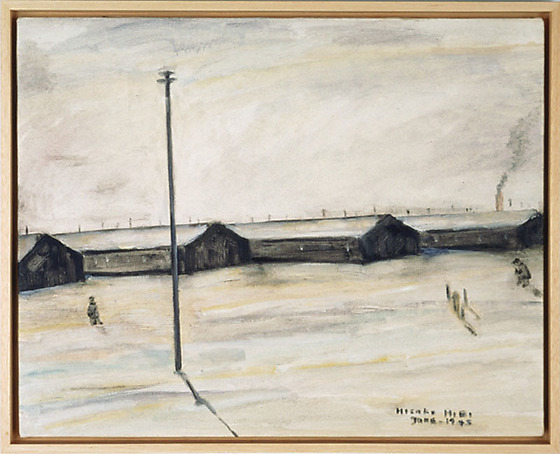 Entitled "White Heat" this painting is the first snow-filled landscape painted by Hibi while incarcerated at Topaz concentration camp. The internees were used to the mild weather of the San Francisco Bay Area, thus, the harsh Utah winters were especially difficult. In addition, the facilities of the concentration camps did not provide much comfort from the snow and extreme cold temperatures. In this painting Hibi portrays a row of barracks from a distance with two sketchy figures dotting the landscape. A single electrical pole stands at the left, while some smoke from a chimney rises in the distance. The white expanses of snow and sky border the thin row of barracks. Instead of offering a pristine white land and sky, Hibi utilizes yellow, blue and grey patches of color throughout this landscape scene.